WELCOME TO THE NEWLY-DESIGNED VISIBLE MUSIC WEBSITE !!! Here’s a wacky little tune to begin the adventure. oooh! Composed by Jean, arranged by Norman in 2003. 25 March: Symp.No.8 broadcast on Radio 3. The film, Artheme Swallows his Clarinet (1912), played here using the music software programme 'Sibelius 7 sounds'. 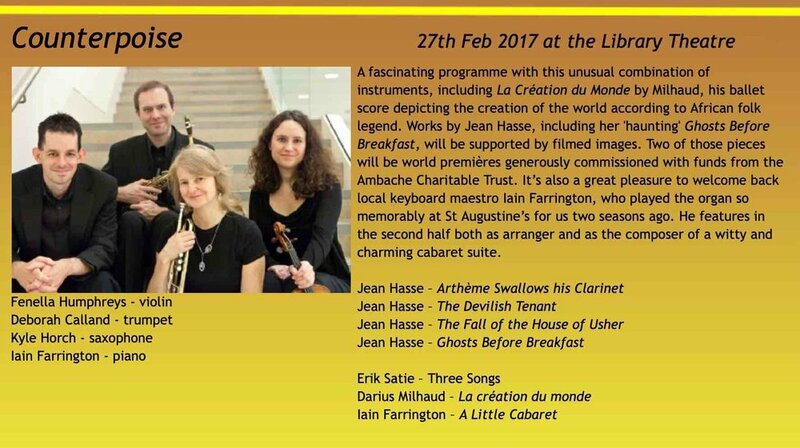 The score by Jean Hasse for violin, trumpet, saxophone and piano was premiered live by the Counterpoise ensemble at the Luton Library Theatre (UK), 27 Feb 2017. 12 April: The Unnameable, music by jazz quartet Get the Blessing, plus string orchestra, piano, harp, percussion. Premiere: Centre de Arte, Ovar, Portugal. This piece and other GTB arr./orch. by Jean and William Goodchild premiered with the Bristol Symphony Orchestra in June 2018. Jean Hasse: without you (2018) (5:00) for soprano, clarinet and piano, premiered in Bristol on 12 Nov 2018, by the Gemini Ensemble (Sarah Leonard, sop, Ian Mitchell, clar/b.clar, Joby Burgess, perc.). Score available. All content on this website is Copyright © Visible Music and Jean Hasse. Website designed by JH using Squarespace.